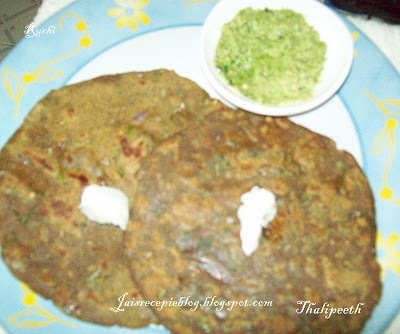 Thalipeeth is a type of a savory pancake which is a popular dish of Maharashtra.. It is spiced pancake with flavor and nutrition.. It is a tasty and quick-to-make snack once you have made and stored the flour.. The recipe can be accessorized as per your likings and it makes a delicious breakfast, quick lunch or for dinner. I always made this thalipeeth with so many flour(Ragi, Jowar, Bajra, wheat,besan,rice,) and many different types of grains...dal, and spices, all roasted and ground into a wonderful aromatic flour.. Traditional way to serve thalipeeth is with green chutney and either some plain yogurt or a dollop of butter. 1 .Mix all ingredients (except oil). Add water as required, a little at a time and knead to form, a soft dough. 2 .Divide dough into 7-8 equal portions. Flatten each portion on a grease (with oil) banana leaf or a thick polythene sheet, into a round shape. 3 . If you are using plastic sheet apply some oil to the sheet. Then take one ball, flatten it in your palm & then place that flattened ball on sheet. Press that ball with your fingers evenly. Make sure thalipeeth should be just size of your palm because if you make it bigger it will break while lifting it. Dip hand in water in between, if it is not spreading properly. 4 . Heat non-stick tava or griddle. Apply some oil. Remove thalipeeth from sheet gently & place it on the tava. 5. Spoon a little oil on the sides and cook on a low heat till it turns crisp and golden brown. 6. Turn the thalipeeth and cook the other side, as above. Cook till it becomes crispy, brown on both sides. 7 . Serve hot with ,chutney, yogurt or homemade butter. Grind all ingridients to fine paste.thens dd lemon juice mix well and serve.This chutney goes along with all dishes. This looks very tasty an healthy too with such a wonderful combination of flours. I love these all flours combined together in this one,great recipe and healthy one too!! Very new to me,thanks for sharing Jaishree! Wow so many nutritious legumes....Looks yummy and healthy. Wow such a healthy thalipeeth, thats a wonderful dish with loads of nutritious stuffs! never tried makin thalipeeth at home,..but i gonna try soon now,..:)looks yum,..
Yummy and healthy dish ! Looks gr8! looks very tempting. this is new to me. I like the combination of various flour..
Thalipeeth is very new to me. Thanks for sharing. Seems nutritious. nutritious dish jaishree, and never heard of it, thanks for sharing. This is the first time I am visiting your blog..Thalipeeth looks yummy! !